Because we work in the wedding and engagement photography industry in the Washington, DC, metro area, we spend a lot of time thinking about how to create wedding-day images that are not only beautiful, but that will help a newly-married couple relive the memories of their marriage celebrations with their children and grandchildren in the many subsequent decades of their married life. We strive to make every picture that we deliver to them a portal through which a bride and groom can travel back to those beautiful moments when they were getting ready to meet one another at the altar, when they were pledging their eternal love for each other and when they were basking in the happiness of the step they had taken. Producing photographs that have this much power requires the ultimate mastery of the craft of wedding photography, careful attention to detail and not just a little bit of luck. Because of that last part, which means that some things are out of our control, we put a lot of effort into the first two. When we are not actively photographing a wedding or an engagement, we devote a lot of time to studying and envisioning the kinds of shots, angles and posing that make photos of a marriage celebration truly unforgettable. We also work to gain the experience necessary to know when a meaningful moment is about to happen, so that we are ready with our cameras and in the right position when it takes place. Through this process, we have learned many things about the best ways to get every single part of a wedding day immortalized on film. We know how to find the light in a hotel room that makes a bride look her very best in a portrait. We have discovered the perfect places in which to stand in a church to capture a couple’s first kiss on film as dramatically as possible. We have come to understand how to tell two newlyweds’ love story simply by having them hold each other in a particular manner. One specific thing that we have learned is what makes a great dance floor picture during a bride and groom’s wedding reception. More than anything, photographs from that portion of a wedding day should communicate motion. People at a wedding reception are never standing still; instead, the celebratory phase of a marriage event is typically a swirl of movement, energy and dynamism. That can make it a little challenging for the wedding photographers to get the shot that we are looking for. It is not uncommon for a wedding celebrant to inadvertently dance their way into our picture, for example! But the goal for us is still to take pictures that do more than just show people standing around. It should be clear to anyone viewing the images that people are dancing in celebration of two people having tied the knot. That is why we are especially proud of this particular photo. We took it during a wedding reception at 101 Constitution, a fabulous and elegant Washington wedding venue with a stunning view of the US Capitol Building and the Washington Monument. 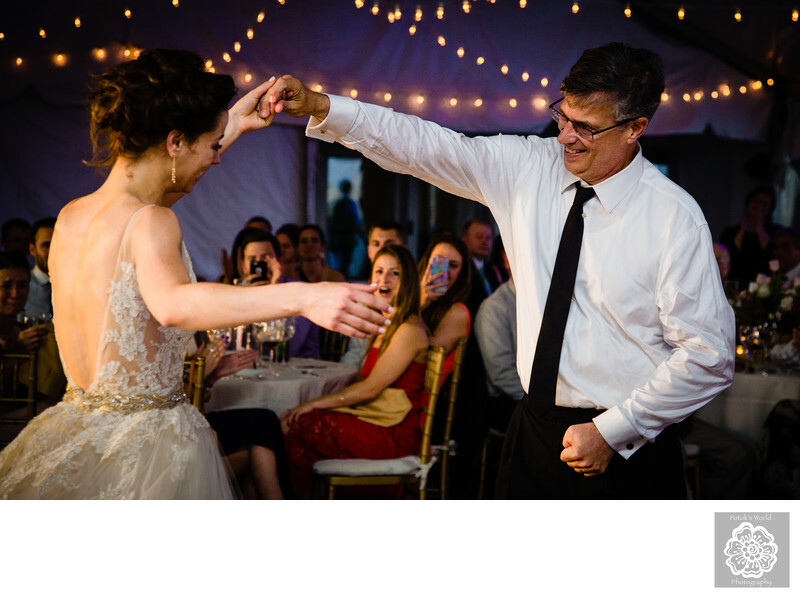 The newly-married bride and her father were sharing the traditional father-daughter dance, and we captured on film the exact moment when the father of the bride sent his daughter spinning outward. Location: 101 Constitution Ave NW, Washington, DC 20001.